The annual Lincoln MoneyGuard II statement your clients receive is changing. View the resources below to help you become familiar with these changes. We believe the enhanced presentation of information will make it easier for policyowners and their advisors to understand and manage their policy benefits. Enhanced statements for Lincoln MoneyGuard® Reserve and Lincoln MoneyGuard® Reserve Plus are in the process of being updated with a launch expected later this year. Products, riders and features are subject to state availability. The insurance policy and riders have limitations, exclusions, and/or reductions. Check state availability. Long-term care benefit riders may not cover all costs associated with long-term care costs incurred by the insured during the coverage period. Accelerated death benefits may be taxable and may affect public assistance eligibility. Lincoln MoneyGuard® Reserve, universal life insurance policy form LN850 (8/05) Rev with a Convalescent Care Benefits Rider on Rider Form LR851 (8/05), an Extension of Benefits Rider on Rider Form LR852 (8/05), a Return of Premium Rider on Rider Form LR850 (10/07), a Terminal Illness Accelerated Death Benefit Rider on Rider Form LR853 (8/05), a Right to Purchase a Long-Term Care Policy on Endorsement Form LR856 (8/05), and a Nonforfeiture Benefit Rider on Rider Form LR855 (8/05). Only available in NY. 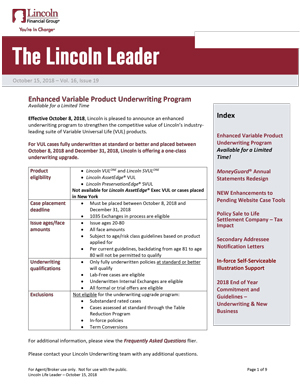 Lincoln MoneyGuard® Reserve Plus, universal life insurance policy form LN870 with the Convalescent Care Benefits Rider (CCBR) on Rider Form LR870, an optional Enhanced Surrender Value Endorsement (ESVE) on Endorsement Form B10465F, an optional Extension of Benefits Rider (EOBR) on Rider Form LR871, and an optional Nonforfeiture Benefit Rider (NFO) on Rider Form LR872. Not available in NY. Lincoln MoneyGuard® II, universal life insurance policy form LN880/ICC13LN880 with the Value Protection Rider (VPR) on form LR880 and state variations/ICC15LR880 Rev, Long-Term Care Acceleration of Benefits Rider (LABR) on form LR881/ICC13LR881, and optional Long-Term Care Extension of Benefits Rider (LEBR) on form LR882/ICC13LR882. Not available in NY.